Here is the latest nomination in our series highlighting people David Cameron should consider appointing to the House of Lords. 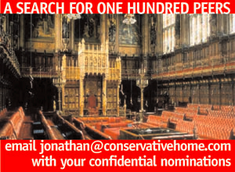 If you would like to nominate someone, please email Jonathan Isaby with your suggestion, ideally including key arguments for the nomination as well as biographical information. The sources of nominations will be treated confidentially where requested. "I'd like to nominate Ruth Lea, former Head of Policy at the Institute of Directors and founder of the Global Vision Think Tank. As well as a glittering business career and proven track record of leadership and achievement, Ruth has been a long-standing defender of conservative principles, sound money and small government. "She then became Economics Editor at ITN before moving to the IoD and most recently Global Vision, a think tank aimed at maximising Britain's trade opportunities through an internationalist outlook, rather than a dogmatic obedience to the EU project. "Ruth's experience in business, in the media and as a conservative academic make her ideally suited to a place in the Upper House, where she'll be particularly needed to sort out the inevitable economic mess left by Gordon Brown and to reintroduce 'sound money' principles to British Economic Policy, along with a global outlook on trade that can underpin the future success of the country in more than just the economic sphere. "I'm sure than many ConHomers share my view that Baroness Lea of Finchley would be a great addition to our team".